In my mind, current university rankings by the U.S. News and World Report should be soundly repudiated by public universities acting as a group, and a case should be made to split the ranking lists of private and public universities. I am assuming here that we will continue to insist on numerical measures of academic success, however incomplete and distorted these measures are. That's because I realize that we are insignificant parts of the ever more powerful Machine. Let's start from a scene from a Roman Polansky movie. Imagine a lavish ball in an old castle. The walls of a spacious, richly ornamented ballroom are lined with tall mirrors and a chamber orchestra is playing in the corner. On the floor, dozens of pairs of bejeweled beautiful ladies in long dresses and elegant men in dark suits are dancing with great skill. It's a breathtaking view! Then you look at the mirrors and all you can see is the empty ballroom. What you observed was an illusion, a beautiful but empty image. You just watched the Annual Vampires' Ball in Count Dracula's castle. The ever-insecure public academia is examining herself with trepidation: "In my cheap dress, will I look as pretty as those private school dames?" The simple answer is: "No, public academia is different than private schools, clothed or naked. We serve different societal needs, and we should stop comparing ourselves to our very rich but distant second cousins." Cumulatively, the top 15 public universities charge a little less than one quarter of the tuition and fees charged by the 15 top private universities, and enroll roughly four times more students. 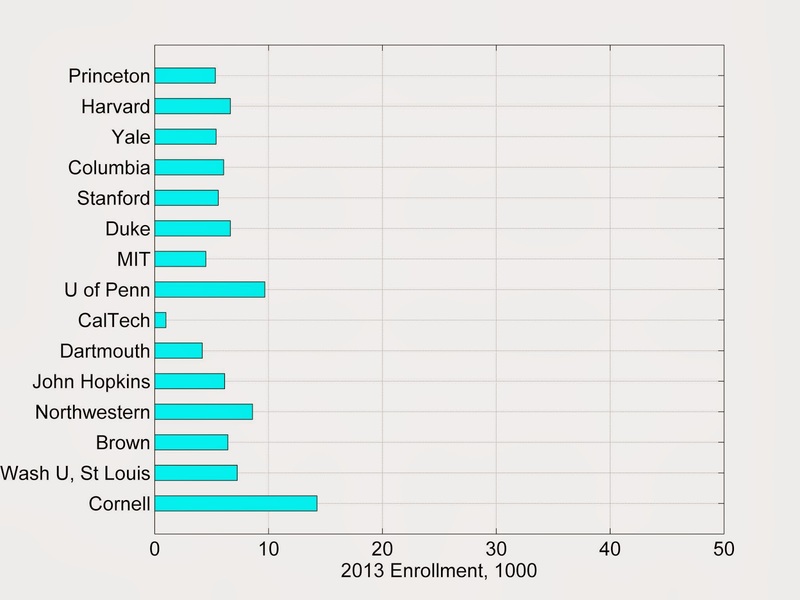 By this metric, the cohort of 15 top U.S. public universities is 16 times (sic!) more efficient than the comparable cohort of private universities. Therefore, it is only right that anyone who feels like it harasses and admonishes public schools, while the private school slobs are living serene fulfilling lives. Source: E.C. 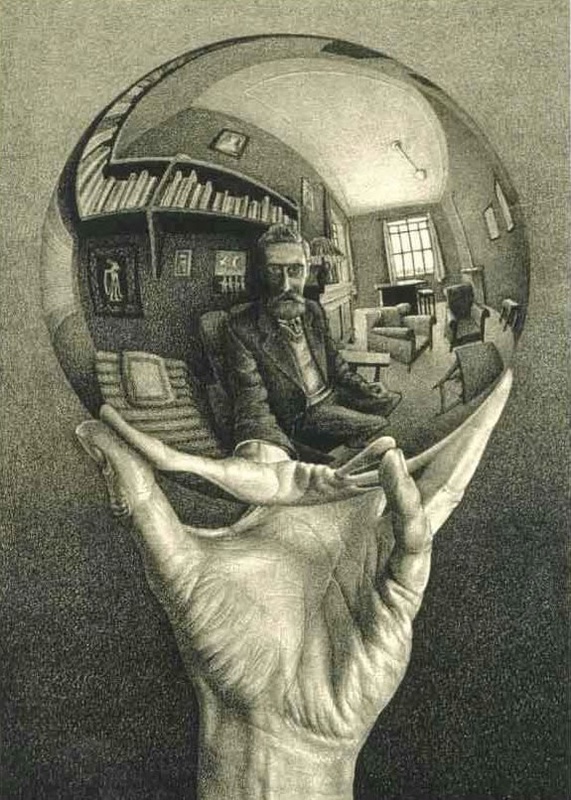 Escher, "Hand with Reflecting Sphere," 1935. Which brings me to academic rankings pursued by public universities with troubling desperation. As I wrote in Part I of this series, private universities need not worry: By definition, they are on top of all rankings. Think of this, if private schools were not highest-ranked, who would spend up to $100K per year on private education if 25% of that sum would buy equally good public education? The small but luxurious private universities are gate keepers, who for the right price dispense lifetime membership cards to the American nomenklatura. Therefore, no one at the US News and World Report would dare to question the glittering supremacy of the Ivy League schools, never mind that as a cohort they are 4.4x3.7=16 times less efficient than the comparable public universities (see Figures 1 - 4 and 5 - 6). After all, the United States of America has invented the beautiful and tempting, but otherwise empty images. And this invention has served some of us very well. Then as the 2012-2013 school year commenced, Joseph Asch, Dartmouth '79, wrote an open letter the incoming class of 2016 on the Dartblog titled, "Freshman, There Will be Lies." In his letter Mr. Asch warns, among other declarations, that students should begin their time at Dartmouth with the understanding that the administration will lie, underscoring his point by asserting, "Not small lies, or white lies, or inadvertent ones, but straight-out lies that help the administration gain the goals that it seeks at your expense." He reverses all that the students once thought true about an elite academic institution by telling the class that although they expect this "noble institution" to serve the students, in fact the administration "has goals to achieve, and work in an environment where lying has been part of the modus operandi for many years." In summary, public and private universities are fundamentally different and should not be lumped together in an artificial way that boosts the Ivy League schools relative to the poorer, busier, and less glamorous public university cousins. In Part III, I will get deeper into these gaping differences and public misperceptions. P.S. (02/21/2014) If you think that the private and public non-profit schools are less than perfect, you should also look at the for-profit universities. The pursuit of short-term profits and generally unethical behavior have created greedy monsters that steal money from the taxpayer and the poor. And Congress seems to be unable to control these monsters, which are feeding on mostly government-backed loans to ruin poor uneducated people. Figure 1. Click on the image to see it in full resolution. 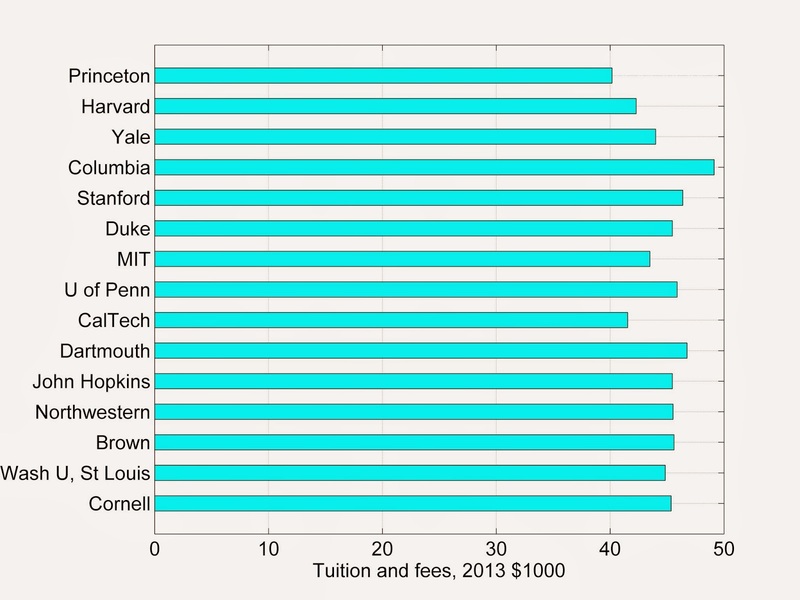 Tuition and fees charged by the top-ranked private universities. All of these universities are at the top of national rankings, i.e., Princeton is #1, according to the U.S. News and World Report. Add another $25-40,000 per year for living expenses. Another question comes to mind: Is this cartel of private schools colluding in setting their tuition levels? Figure 2. 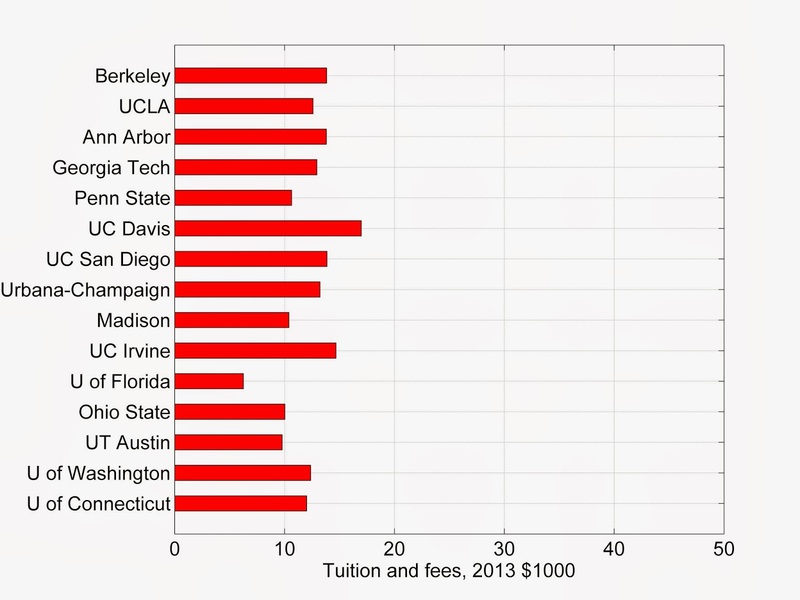 Tuition and fees charged by the top-ranked public universities. U.C. Berkeley, the top public university in the U.S., is ranked as #20 by the U.S. News and World Report. The University of Connecticut is ranked #57. Add another $25-40,000 per year for living expenses. Figure 3. Undergraduate enrollment in the top-ranked private universities. All of these universities are at the top of national rankings, i.e., Princeton is #1, according to the U.S. News and World Report. Figure 4. 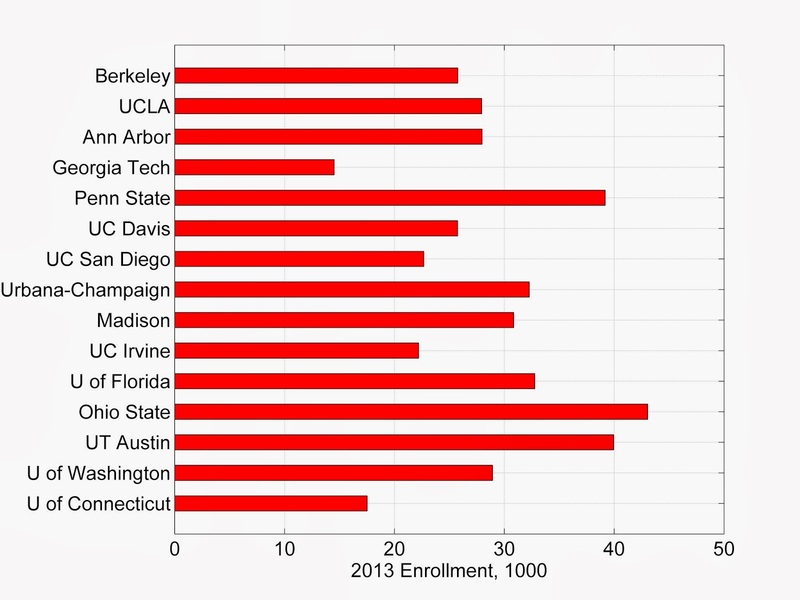 Undergraduate enrollment in the top-ranked public universities. U.C. Berkeley, the top public university in the U.S., is ranked as #20 by the U.S. News and World Report. The University of Connecticut is ranked #57. Figure 5. 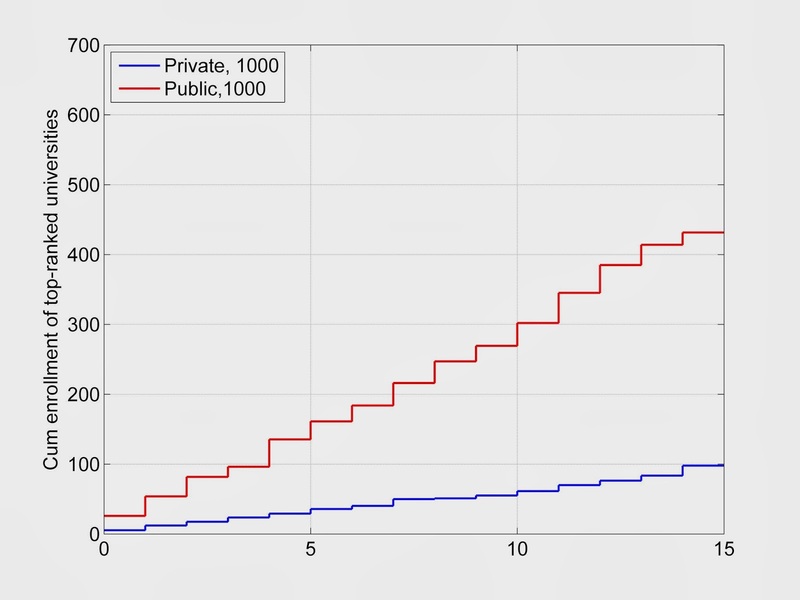 Cumulative undergraduate enrollment in the 15 top-ranked private (#1-15) and 15 top-ranked public (#20-57) universities. Source : the U.S. News and World Report. The cumulative enrollment ratio is 4.4:1 in favor of the public universities. Figure 6. 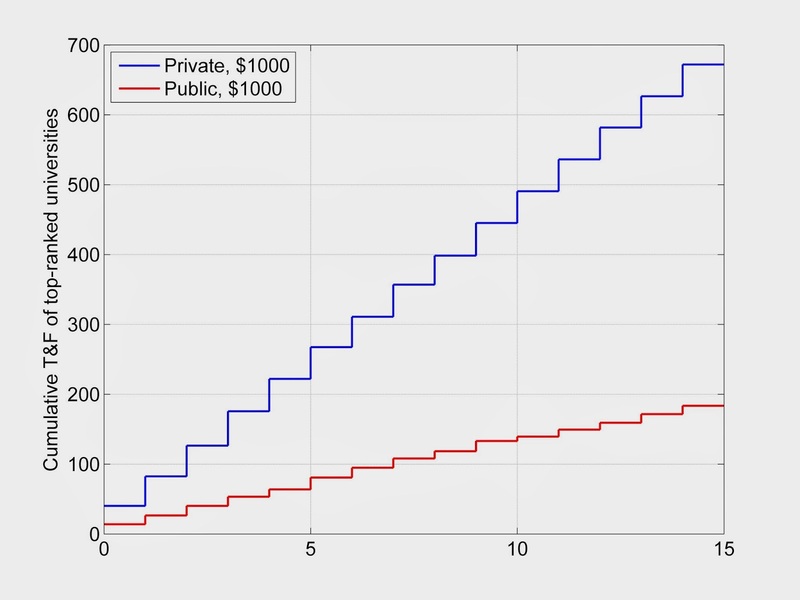 Cumulative tuition and fees charged by the 15 top-ranked private (#1-15) and 15 top-ranked public (#20-57) universities. Source : the U.S. News and World Report. Cumulatively the private universities charge 3.7 times more than the corresponding cohort of public universities. I just wanted to say that I greatly enjoy reading your ideas on society, energy, and the human condition. Please keep writing. With all the due respect, these are NOT ideas. Professor Patzek is exposing how rotten and sick the American [elites] education is. It’s one thing to talk in abstract. However, professor Patzek exposed a very disturbing reality of how screw-up this whole nation is. Also shocking is that you have so few comments in such valuable subject, education. It shows how paralyzing is, when reality hits.